Light is proof, as if any were needed by now, that Theatre Ad Infinitum are staggeringly good. Just staggeringly, staggeringly good. They are a theatre company that completely and utterly confound expectations, and produce plays make you leave the auditorium wanting to tell everyone you know that the absolutely most important thing they could be doing is going to see one of their productions. Hence the gushing opening paragraph. Slowly but surely people are waking up to their talents. 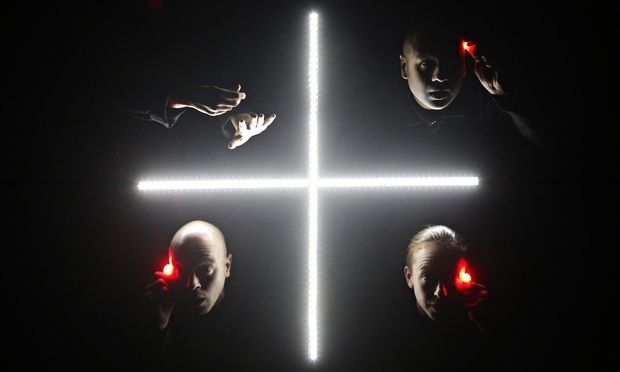 Light, performed as part of the London International Mime Festival, sold out months ago. 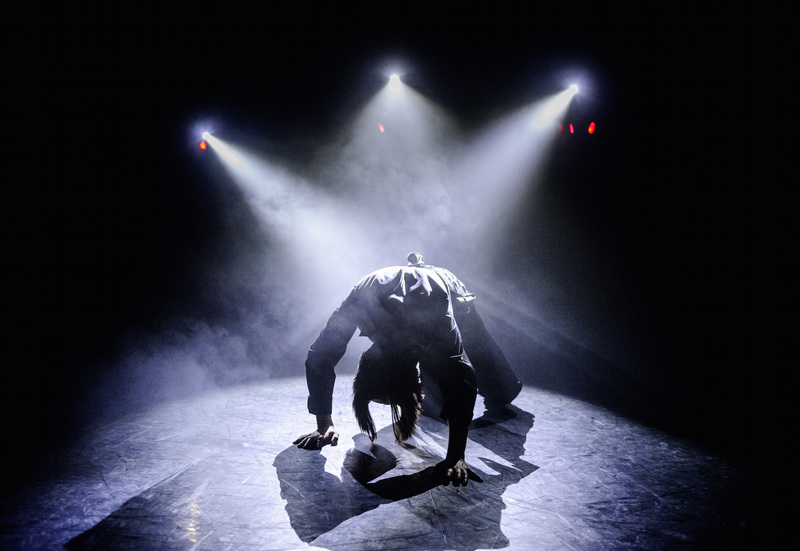 They clearly have a devoted fan base and have won a number of fringe awards but it feels like they are currently on the cusp, like 1927 with Golem, of producing a show that takes them out of the Barbican’s rather tiny Pit theatre and onto the main stages. Theatre Ad Infinitum are not a company that like to sit still. They came to my attention at the London International Mime Festival in 2012 with Translunar Paradise – a work of quiet, tragic brilliance. It demonstrated in its simple, understated way the art of puppetry and despite the alienating effects of the mime it felt more human than any other play produced that year. They followed it up with something completely different; the hyper-verbal, bundle of energy that was Ballad of the Burning Star. If not as technically refined as Translunar Paradise, it was a fabulously entertaining take on the most contentious issue in world politics. It was a forceful piece of theatre that refused to allow itself to be pigeonholed and gave very few easy answers. And now they are back with Light. This time we are in genre sci-fi territory with a dystopian piece of futurism, imagining what might be as twin developments in technology and neuroscience allow for an ever greater entwining of individual and social consciousness. To be honest the plot is not strong. This is a story that has been told many times over and although it is pegged to a post-Snowdon vantage point, it is the kind of issue science fiction writers have been cranking out for years. Yet what Light makes so brilliant is Theatre Ad Infinitum’s wonderful design conceit of making the natural lighting state pitch black with illuminations only coming from handheld devices. If it sounds like a gimmick then it is a gimmick that continues to deliver throughout the 80 minute running time. It is reminiscent of Frank Miller’s genre-defining Sin City comics, where he exploded convention with the use of high-contrast black and white to create images that burnt themselves onto the reader’s retinas. One gets a similar sense from George Mann’s direction. Image follows image follows image. Each time it snaps back to black before lighting up something new. The opening series of tableaus are a microcosm of the whole, beautifully executing something quite chilling. If the story can verge on the generic and the dialogue errs on the clichéd then the audience barely seems to notice as their attention is kept rapt by visual effect after visual effect. This is a production where storytelling takes a definite backseat to experience. The ensemble cast are excellent and the technical skill to work so quickly in total blackout as they move through the different scenes is pretty mindblowing. They take on multiple functions – playing their characters but also acting as stagehands to provide illuminations for the scenes that continue around them. The transitions are fluid, fast and seamless. Despite everything existing in the tightest frame of reference, focussed entirely on the actor, we are given the sense of a complete dystopian future world where technology is all. Underpinning the show is a pulsating electronic soundtrack from Chris Bartholomew. It is this thrusting, insistent score that drives the action and keeps the momentum and tension high throughout. Mention must also be made of Matthew Leventhall, Lighting Consultant. Light is a reminder that stage effects don’t just happen by themselves. Too often the director is given all the credit for what a show looks like but without Leventhall then Light could not have happened. Theatre Ad Infinitum have once again arrived at the London International Mime Festival with something quite special. Sadly it is sold out in London but anyone reading the blog from farther afield should definitely check out whether the touring schedule means it will be turning up at theatre near you. And if it is – go.